Women pay less for auto insurance - It's a Fact. Compare car insurance companies and learn about online discounts. A 2.4L Ecotec DOHC engine, sporting 4 Cylinder and 6 speed automatic transmission, this vehicle has 182 horses, a bit under average for a 3,600 pound sedan. The car handles well, but is underfunded in power and acceleration. Not that everyone is going to be driving this at the Autobahn, mind you. 2.4 liter 182 horsepower four Ecotec DOHC. Adequate acceleration, but don't expect to win races. You may want to wait for a lustier sports model due this coming year. It's a honey! 19 City/30 Highway 19/30. Annual fuel cost estimate based on 15,000 miles at $3 a gallon: $1,958. Counting on design to jump start the brand, Buick is almost at 10. The cars details and amenities are sharp and mindful. An all around great choice for a woman with heated side view mirrors, keyless entry, leather upholstery, and heated front seats all standard. Even heated exterior mirrors for the colder and icier conditions. Very strong and sturdy oversized 18" alloy wheels. The car we tested had the optional equipment with power sunroof and master blaster speaker system. The new Regal has to be one of the most talked about cars of the year, and for good reason. It's the sportiest Buick since forever, and it has beautiful craftsmanship and finish. Terrific looking, too. But it still needs to step it up in both charisma and even more dramatic looks to play with the big boys in this market, I think. Stabilitrak stability control and traction control, airbags front and side, impact thorax driver & front passenger, head curtain side airbags, battery rundown protection, OnStar and a host of other items. A 9-speaker stereo with CD/MP3 player, satellite radio, iPod/auxiliary audio jacks and steering-wheel-mounted controls and Bluetooth connectivity. Air filtration system, tilt and telescoping steering column seven speaker audio system USB port, Blue Tooth, Ultrasonic rear parking assist, Driver Information center, full power equipment, two 12 volt outlets, painted alloy wheels, etc. Great lines, terrific grill and headlights; the car echoes luxury inside and out. I really liked the looks of the Regal, but not quite as much as I like the luscious LaCrosse. Few sedans can top that one! Semi fastback design should work well-- remember Buick had it on some 1980s era Centuries? Still, I think it could use some more arresting features in design considering it's going up against some heady competition. But a very nice first effort. Congrats to Buick. 4 year/ 50,000 mile bumper-to-bumper with premium care maintanence. 5 year, 100,000 mile powertrain limited warranty, four year/50,000 mile bumper to bumper warranty. The Regal is based on an Opel sedan and built in Russelsheim, Germany. 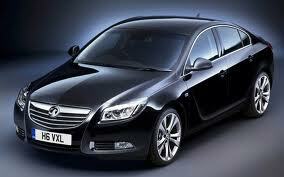 Opel has so many terrific designs I can only hope that Buick will bring plenty more over here. It's really good to see Buick coming back, one of my favorite brands.